No downtime, no surgery, and absolutely no pain or discomfort! 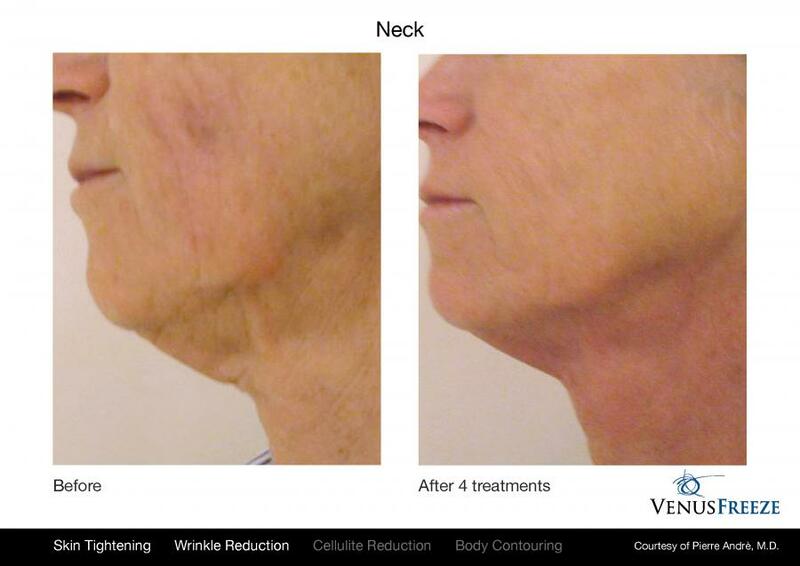 Wrinkles on the face, sagging neck and chin, loose skin on the arms, crepey skin at the knees or elbows, or lumpy buttocks or thighs... the Venus Legacy does it all! This procedure is also great for tightening skin post-liposuction or after having a baby. 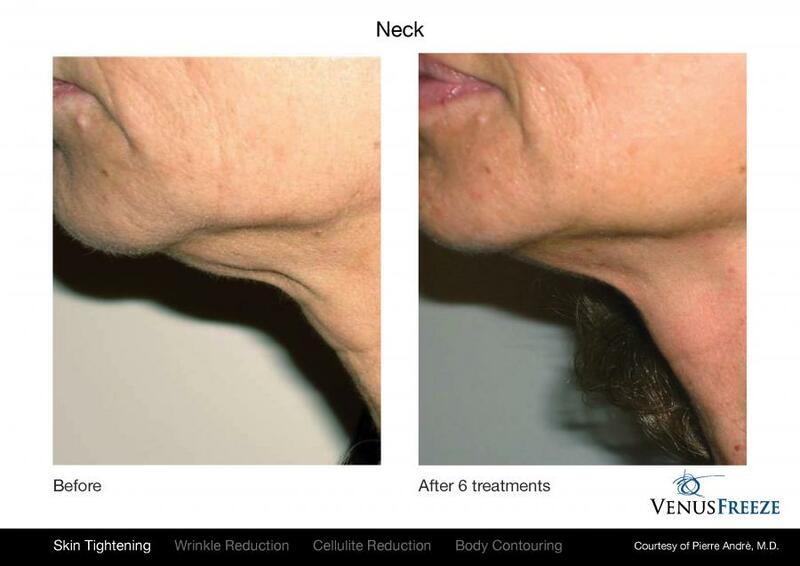 Formerly the Venus Freeze, the Venus Legacy offers non-surgical skin tighening for the face and neck, as well as body contouring, cellulite and stretchmarks reduction for any area of the body. This superior, non-invasive series of treatments tightens skin, improves wrinkles, smooths cellulite and often reduces circumferential fat too. 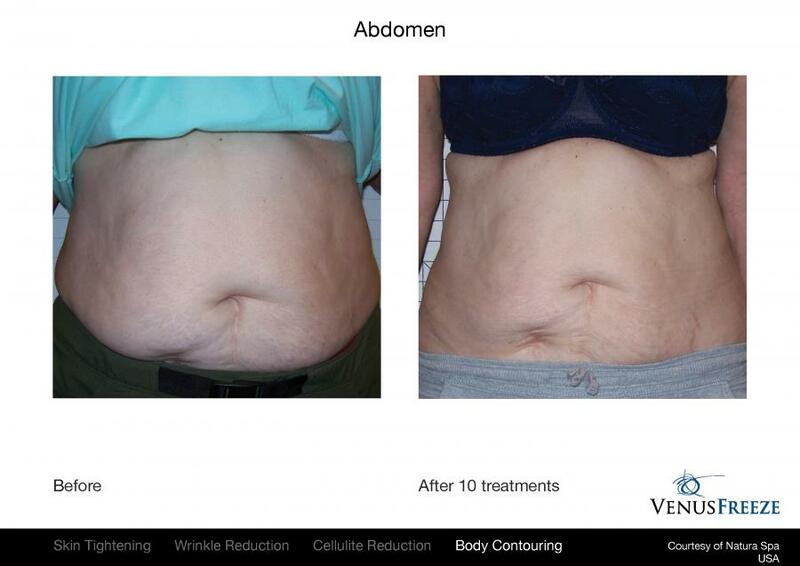 Not only is the Venus Legacy an affordable alternative to more invasive procedures, treatments are safe, effective and extremely comfortable! 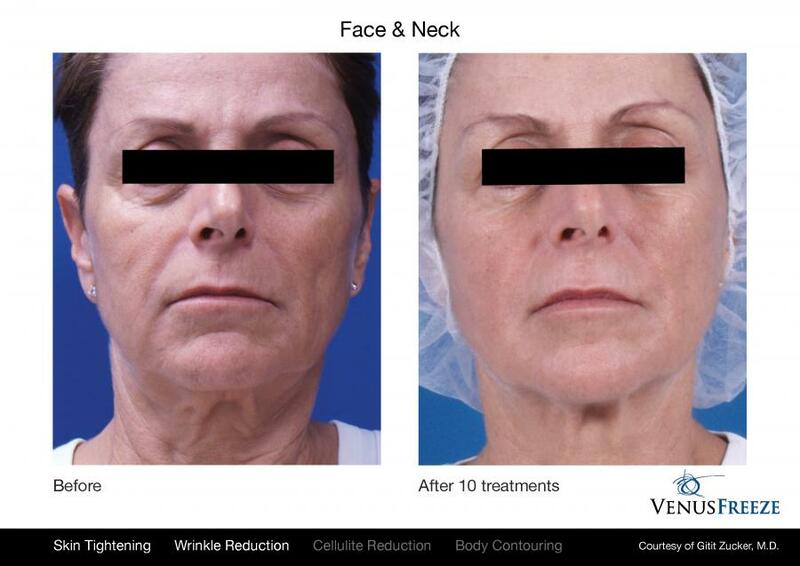 Finally, a treatment that both feels good and delivers amazing results! 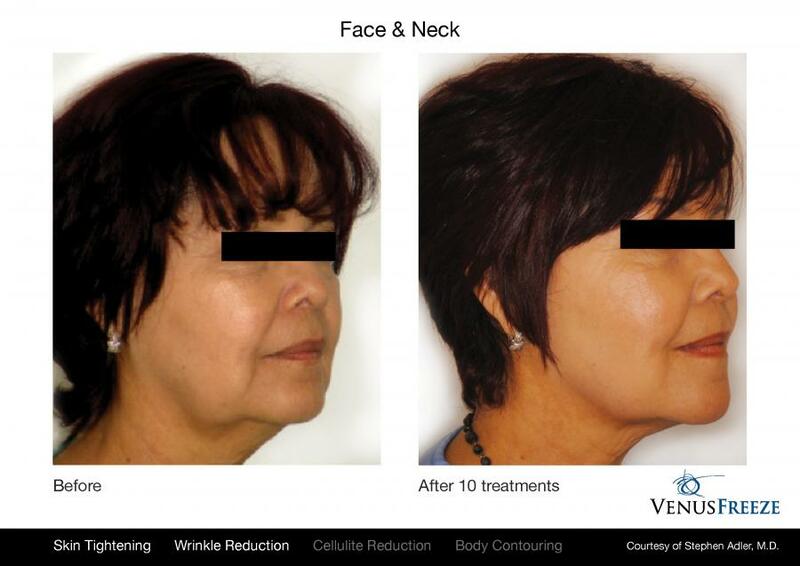 Whether you have a certain area on your body that has always bothered you, or you just want to minimize the effects of aging, just about anyone is a candidate for Venus Legacy treatments. Individuals who need minimal to moderate skin tightening or circumferential fat reduction generally get the best results from this treatment. Larger areas or extremely loose, sagging skin may require a different approach depending on the end results you want to achieve. 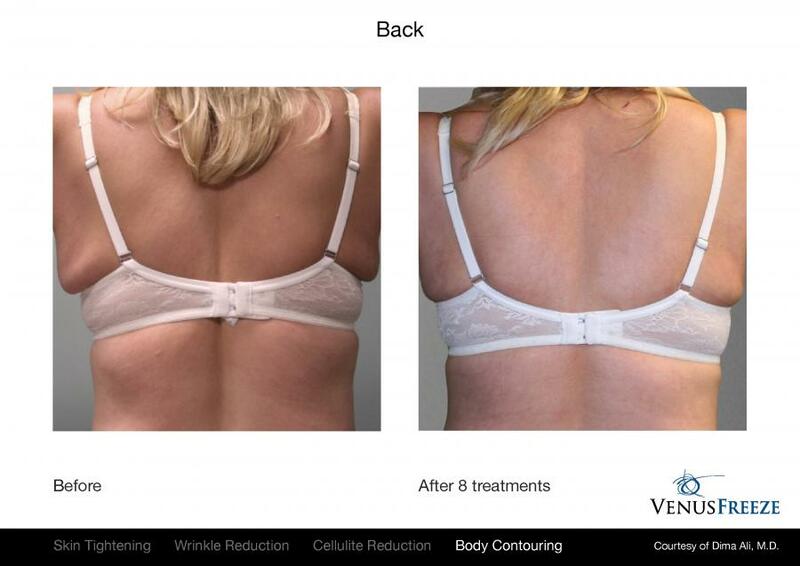 Because everyone is different, we recommend a complimentary consultation if you are interested in the Venus Legacy. During a consultation, we will review your medical history, evaluate the area to be treated, and discuss your aesthetic goals to ensure that the Venus Legacy is the best treatment for you. This treatment is not indicated for individuals who are pregnant, or who have implantable defibrillators, cardiac pacemakers, or other metal implants. Some clients may be required to provide a doctors note for certain conditions. Any part of the body can be treated. The most common areas include the face, neck, arms, stomach, buttocks, hips, and thighs. Results will vary because everyone is unique whether it is physical attributes, skin or health conditions, lifestyles, and/or personal goals. These factors also impact how soon you will see results. Many of our clients see slight improvement or a tightened effect even after their first treatment. 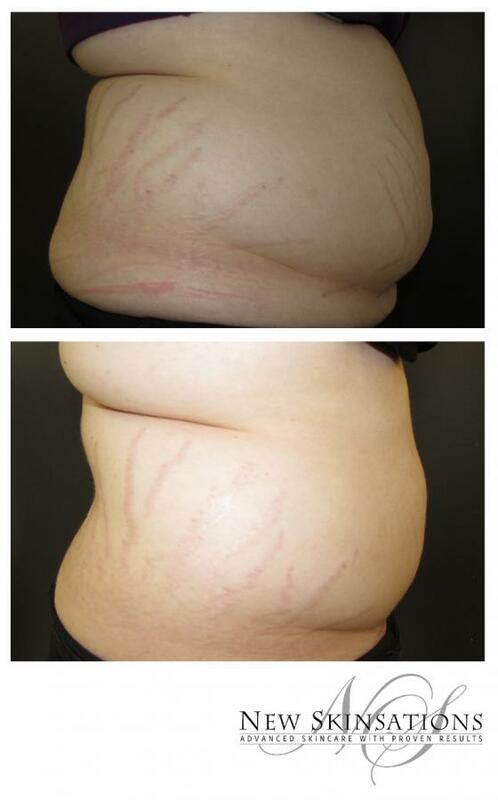 You may start to see results for cellulite and circumferential reduction following the 3rd treatment or so. Generally, results will be apparent following the third or fourth treatment. Keep in mind results build with each weekly treatment, so you will gradually see results. After a series of treatments, you can expect to see tighter skin, softening of wrinkles, a plumper, fuller and more youthful appearance, reduced cellulite and a more contoured silhouette. 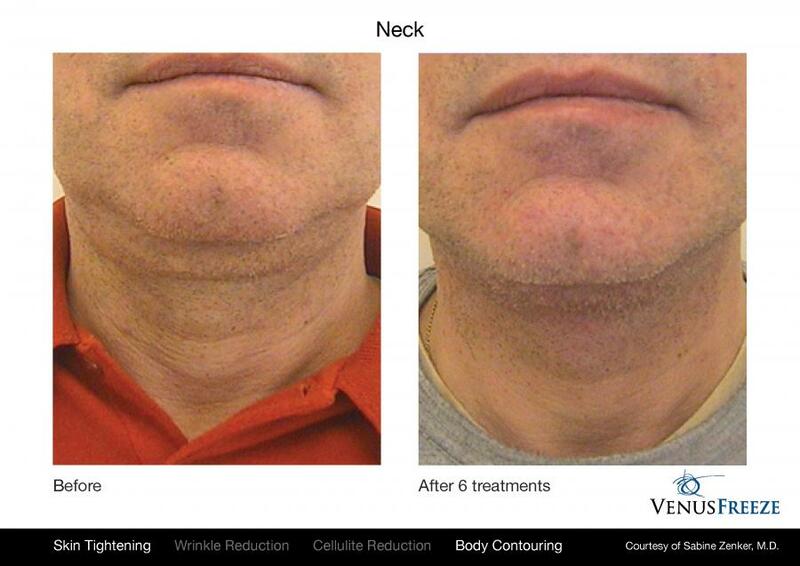 Long-term results can be achieved in approximately 6-8 treatments. However, it will take several weeks to see the full effects of your results after completing the last treatment of your treatment series. 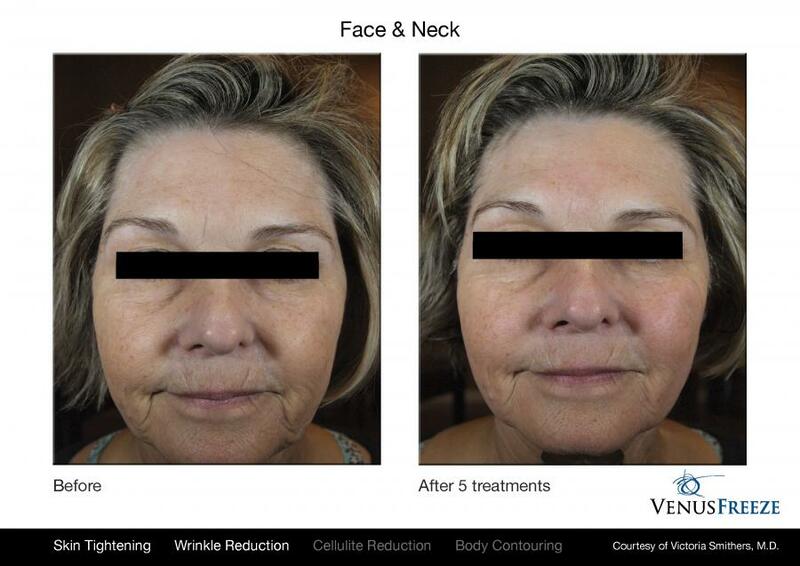 The Venus Legacy combines Mult-Polar Radio Frequency and Pulsed Electro-Magnetic Fields to create a dense, therapeutic heat matrix through multiple layers of skin. This stimulates the body's natural healing response and triggers the production of new collagen and elastin fibers. When collagen fibers in the skin are exposed to a certain amount of heat, their structure is modified and they immediately contract, making the skin tighter. This effect can be noticeable even after the first treatment. The pulsed magnetic fields also provide the added benefit of increased oxygen, nutrients, and blood to the skin, giving it an immediate, long-lasting glow. In summary, the combination and application of these two technologies causes existing collagen to contract which tightens the skin, generation of fibroblasts (cells in connective tissue that produce collagen and other fibers) to produce more collagen, the formation of new dermal blood vessels within the tissue, and the breakdown of fats and other lipids to release fatty acids. All of which bring about a healthy looking, smoother skin with improved elasticity and texture. 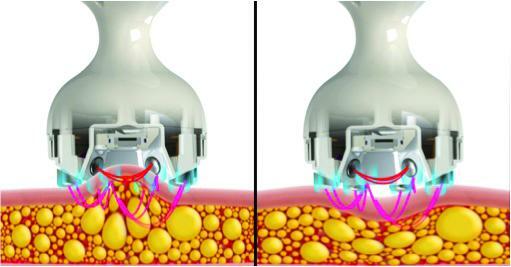 Suction, if used, helps to break down fat and cellulite on the body. Not only is this treatment completely painless, but it actually feels good – the Venus Legacy is a gentle, massaging treatment unlike other corrective procedures of this nature. Many clients have even claimed that the Venus Legacy feels like a hot stone massage and others have even fallen asleep during treatment. When you are ready for your Venus Legacy treatment, one of our trained professionals will adjust the treatment settings appropriately. A gel will be applied to the skin, and then, with the Venus hand piece in contact with the skin, multiple passes will be made over the target area to raise the temperature of the skin to initiate collagen restructuring and fat cell reduction. You will feel a nice warmth over the skin. Treatment time depends on the area being treated, but once the treatment is complete, you can return to your regular activities immediately after. There is absolutely no downtime with this treatment. You can wear makeup and return to your regular activities immediately after. Drink plenty of water throughout the day – at least eight 8-oz glasses per day. Get regular exercise. We suggest at least 15 minutes of walking every day. It is best to get some exercise right after your treatment if possible. Do your best to eat a healthy diet. This doesn’t mean you have to have a strict diet, just minimize your intake of sweets, fried foods, and avoid foods that are high in fat. Wear sunscreen on your face daily. Protecting your skin from the sun’s harmful rays helps to prevent wrinkles. Avoid smoking and tobacco products. Minimize your use of alcoholic beverages as well. Adhering to your treatment schedule and leading a healthy lifestyle will help you to achieve and maintain optimal results. Following your final treatment of your initial series, we recommend a maintenance treatment once every 3 to 6 months. The number of treatments needed will vary from person to person, but typically 6 treatments for the face and 6-8 for the neck and body. For optimal results, treatments are scheduled once a week for 6 or more weeks depending on the individual and their personal goals. Take advantage of a free consultation to establish your personalized treatment schedule. Treatment costs will vary depending on the area of the body to be treated. Schedule a personalized consultation with one of our trained professionals free of charge to ask questions, walk through the process, and establish how much your treatment will cost. We do our very best to be competitive and make treatments affordable for our clients. Pay as you go or take advantage of our package pricing - prepay for your treatment series and receive a discount! Radio frequency and magnetic pulses have been used for many years in medicine and are proven, safe technologies in medical aesthetics. Through clinical trials, it is evident and well documented that magnetic pulse has a positive effect on wound and bone healing, the creation of new small blood vessels (angiogenesis) and collagen production. This non-invasive therapy was approved by the FDA as a safe and effective technology for medical use. 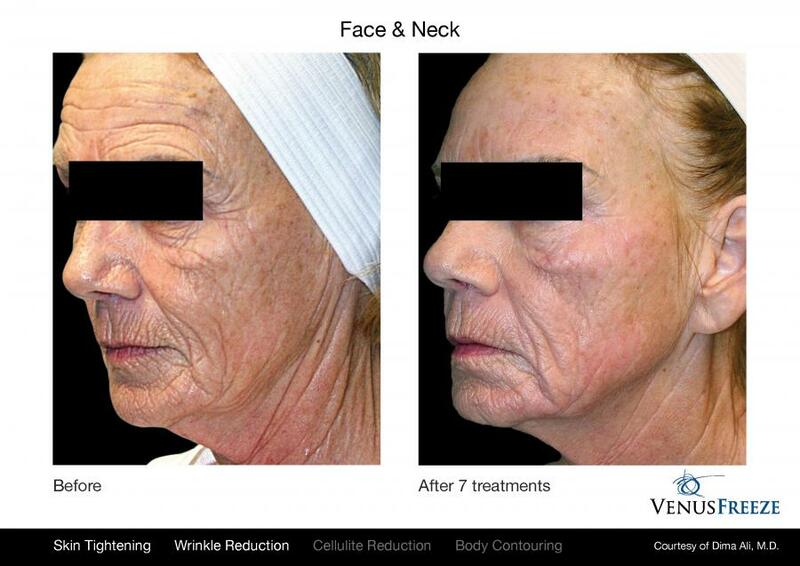 The Venus Legacy uses this technology to dramatically improve skin appearance through inducement of angiogenesis (the development of new blood vessels) and collagen production, with no downtime or side effects. Our skin care professionals are highly skilled and professionally trained to perform this procedure.